Description The three lines of Arabic writing in the upper part of this large, ceramic wall tile are from the third chapter of the Qur'an, and exhort the Muslim faithful to make the pilgrimmage to Mecca. The rest of the tile is given over to a bird's-eye representation of the Great Mosque in Mecca, with the Ka'ba, Islam's holiest shrine, in the center surrounded by various other structures, all identified in Arabic, and a rectangular portico around the courtyard. 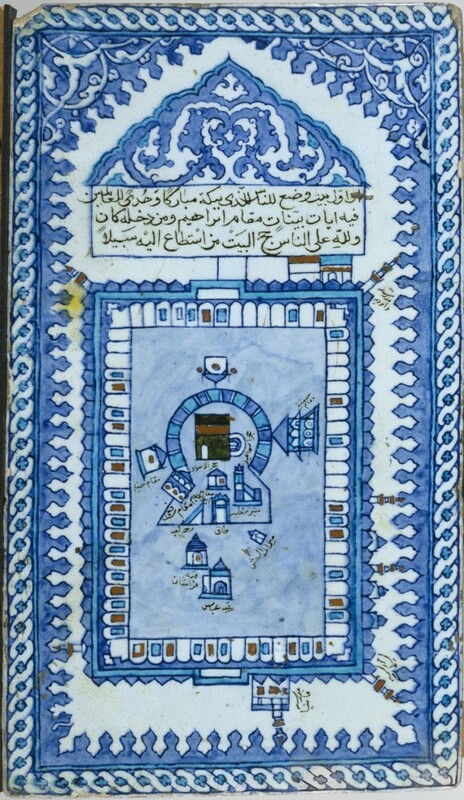 Such tiles may have been created to remind Muslims of their obligation to make the pilgrimage and to introduce potential hajji, or pilgrims, to the places and practices they would encounter in Mecca. The plaques also may have been intended for commemoration and contemplation following a hajji's experience at the Ka'ba. The Divine Word and Sacred Sites of Islam. The Walters Art Gallery, Baltimore. 1997. Provenance Henry Walters, Baltimore, 1897 [mode of acquisition unknown]; Walters Art Museum, 1931, by bequest. Inscriptions [Translation] From Qur'an 3: 96-97: The first House established for the people was that at Bekka (Mecca), a place holy and a guidance to all beings. Therein are clear signs- the station of Abraham, and whosoever enters it is in security. It is the duty of all men towards God to come to the House a pilgrim, if he is able to make his way there.